Summary: The increased external pressure, the decrease in support, and the burgeoning research on collaboration encourage institutions to look internally at opportunities for cross-discipline, cross-departmental, and cross-function collaboration. However, institutions are not set up to do this in a smooth or sustainable manner. Few models exist to encourage collaboration within higher education, but there are models to borrow from in the corporate sector. The study looks at four institutions that engage in collaborative activities to deduce how those institutions are using and adapting strategies that already exist and are promoted within corporate literature. 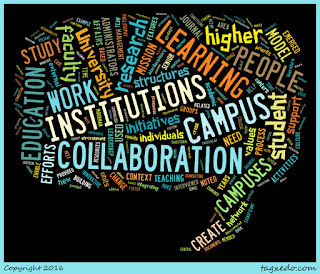 More specifically, this study looks at how institutions create the institutional context that fosters collaboration since little literature exists that addresses this issue and few institutions are able to do it successfully.Integrating interviews, document analysis, and observations, Kezar uses a case-study methodology, recognizing that there are few institutions that create a successful context to foster collaboration and therefore, it would be useful to have substantial details that can be derived through case-studies. 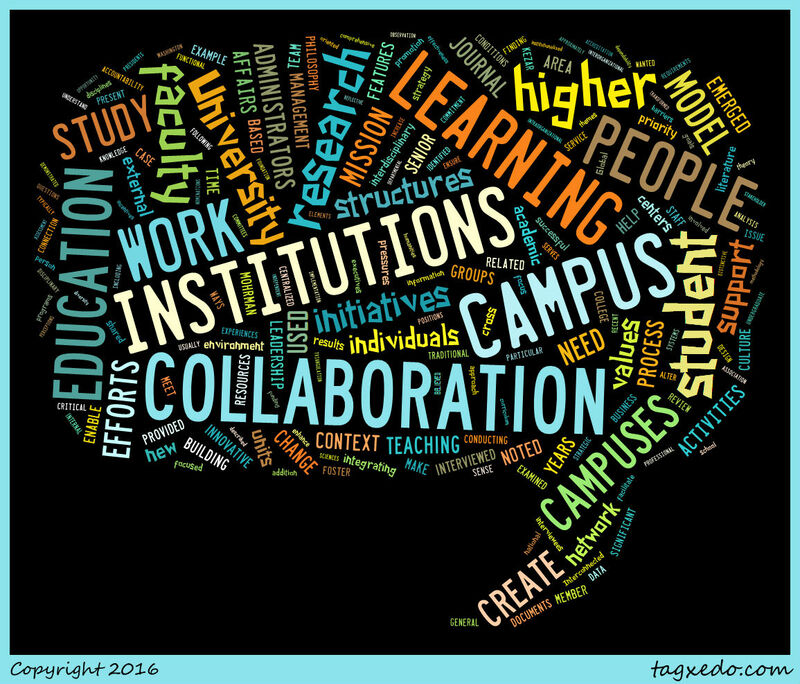 The study chose four institutions that demonstrated numerous collaborations within the institution in the forms relating to: "interdisciplinary teaching/research, learning communities, community-based learning, team-teaching, student and academic affairs collaboration, and cross-functional teams" (Kezar, 812) and based on four criteria: number of collaborative initiatives, clear indication of restructuring the institute to make collaboration happen, reputation for collaboration, and perception of depth and quality of collaborations. One result from the research is that in order for institutes to foster collaborations, it needs to be a part of their mission, and that mission needs to be a clear and well-known or the mission needs to flexible to be inclusive of collaborations that meet the mission's other aspirations. Another result illustrates the importance of fostering a strong campus network that exists outside of standardized central networks of the college. These networks emerge largely from the institute providing many different social and professional opportunities for different campus representatives to be together and exchange ideas. It was also helpful to have nodes in the campus who proved highly interactive with many other aspects of the college. Other strategies included serving on campus governance, creating campus space for faculty besides offices, and increasing transparency and participation. Institutions that were successful also made full use of cross-institutional teams, created centers or institutes to address collaboration, and addresses how such changes worked within the accounting, budgetary, and computer systems within the institute. Finding direct and indirect ways of rewarding collaboration also increased participation. Also, the leadership proved critical in emphasizing the need for collaboration throughout the institute. Any organization looking to foster collaboration should think strongly about whether it is trying to develop a collaborative institution or only looking to make collaboration an institutional norm as the implications for each will impact how the organization moves forward. Institutions seeking collaboration should make sure that focus should include addressing the mission, the structure, and the rewards. Crafting a narrative about the importance of collaboration can be used internally but also address external pressures. Kezar also provides ten recommendations for institutions attempting to emphasize collaboration at their institutes.